"Bethany - Place of Lazarus"
Among those listed in Scripture who lived in Bethany were Mary, Martha, Lazarus, and Simon the Leper. Bethany is approximately 2 miles from Jerusalem and close to the Mount of Olives. It is currently known as a Palestinian village by the name of al-Eizariy. The oldest house in al-Eizarya, (which in Arabic, means "Place of Lazarus") is a 2000 year old house/dwelling that is believed to have been the house of Martha and Mary, the sisters of Lazarus. Jesus reportedly lived, or at least lodged there after His triumphant entry into Jerusalem on what Christians now refer to as Palm Sunday. 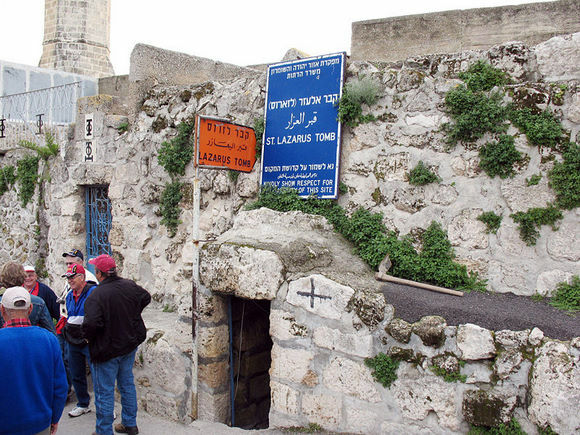 This was also where Jesus was separated from His disciples as He began the journey to Golgotha, and the cross. Some assume that Simon the Leper was someone Jesus had healed of leprosy, but there is no confirmation found in the scriptures. Simon the Leper is found in several scriptures, including Matthew 26:13 and Mark 14:3-9, where Jesus visited his house in Bethany, and a woman, whom we know was Mary the sister of Lazarus anointed His head with a costly ointment. There are other occurrences we will study, probably in our next study, where Mary, Martha and Lazarus were guests of Simon the Leper when he hosted a supper for Jesus two days before the Passover and Crucifixion of Jesus.